ATF Whistleblower Case Spurs Retaliation Inquiry Republican lawmakers in Congress have spent months pursuing allegations that the Bureau of Alcohol, Tobacco, Firearms and Explosives knowingly allowed assault weapons to enter Mexico. Did a key whistle-blower in the case face retaliation? 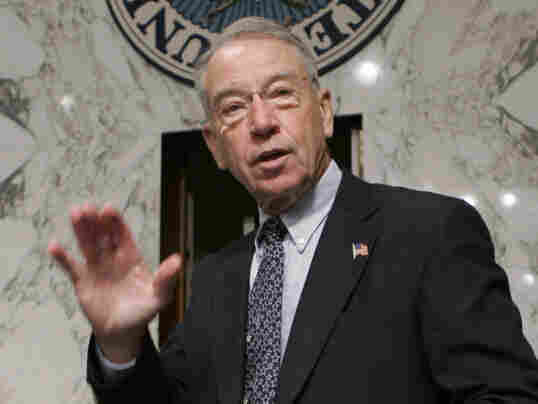 U.S. Sen. Charles Grassley (R-IA) has warned the Justice Department not to punish insiders who talk to Congress about the "Fast and Furious" operation. The Justice Department's inspector general has opened an investigation into possible retaliation against a whistle-blowing agent at the Bureau of Alcohol, Tobacco, Firearms and Explosives, according to two people briefed on the inquiry. Republican lawmakers in both the House and Senate have spent months pursuing allegations that the ATF may have knowingly allowed assault weapons to enter Mexico in order to try to build bigger criminal cases against violent drug cartels that make use of AK-47s and other American weapons. In recent days, GOP lawmakers have demanded information about what the FBI, the Drug Enforcement Administration and senior Justice Department leaders may have known about the investigation into gun trafficking along the Southwest border and the strategies that agents pursued. "Simply put, during this operation ... we, the ATF, failed to fulfill one of our most fundamental obligations: to caretake the public trust [and], in part, to keep guns out of the hands of criminals," Dodson told lawmakers last month. Many of the guns purchased by straw buyers in Arizona at gun shops under ATF surveillance in 2009 and 2010 later turned up at the scenes of violent crime, including the murder last December of U.S. Border Patrol Agent Brian Terry. Officials say tests are inconclusive about whether the weapons found near Terry's body were used to shoot him. Terry's family has hired former Arizona U.S. Attorney Paul Charlton to look into filing a wrongful death claim. Dodson and three other ATF agents told Congress in June that they had serious concerns about Fast and Furious, but they said they couldn't get any of their supervisors to listen. Now, the inspector general is looking into whether one of Dodson's memos, written last year, may have been shared with reporters in an effort to raise doubts about the extent of his involvement in the operation and to discredit him. A spokesman for Acting Inspector General Cynthia Schnedar, and Dodson's lawyer, Robert Driscoll, declined to comment to NPR Thursday. Iowa Republican Sen. Charles Grassley and California Republican Rep. Darrell Issa, who are leading the congressional oversight probes, have repeatedly warned the Justice Department not to punish insiders who are talking to Congress about the episode. "I've warned the administration several times not to retaliate against the whistle-blowers who speak to Congress," Grassley wrote in an email to NPR Thursday. "Unfortunately, there are indications that the administration leaked Privacy Act protected documents to the press in an effort to discredit Mr. Dodson with half-truths even though those documents had been withheld from Congress. It's a very serious matter that should be thoroughly investigated." "Unsurprisingly, this administration yet again acted recklessly by pursuing the personal destruction of their own agent," Issa said in an emailed statement. "This time, they've attempted and failed to smear a patriotic ATF agent even though Senator Grassley and I warned them not to retaliate against whistleblowers." Among the officials who have come forward with concerns is the acting chief of the ATF, Ken Melson, who met with investigators in Congress on July 4, when he complained that he was "frustrated and disappointed" about the slow Justice Department response to requests for information from lawmakers. Justice Department spokeswoman Tracy Schmaler says officials there have turned over thousands of pages of documents, and that any assertion that they haven't cooperated "is not based in fact." Issa's House Committee plans another hearing on Fast and Furious on July 26, focused on ATF officials in Mexico who may have seen U.S. guns flow there. Meanwhile, congressional Democrats say new scrutiny on the ATF demonstrates the weakness of U.S. gun laws and the federal government's need for more power to stop the flow of illegal weapons. Earlier this month, Rep. Elijah Cummings (D-MD), Rep. Carolyn Maloney (D-NY) and Rep. Carolyn McCarthy (D-NY) introduced a bill that would create a new gun-trafficking statute with higher criminal penalties. Deputy Attorney General Jim Cole also announced this month a new program that requires gun sellers to report multiple sales of semi-automatic assault rifles in a short period of time. The program applies to four states along the Southwest border, to help ATF "detect and disrupt the illegal weapons trafficking networks responsible for diverting firearms from lawful commerce to criminals." The National Rifle Association says it will sue to stop that rule in its tracks.